Ok, so I’ve been putting this off for a while now, so I figure if I post it on my website, it will make me accountable & do it. 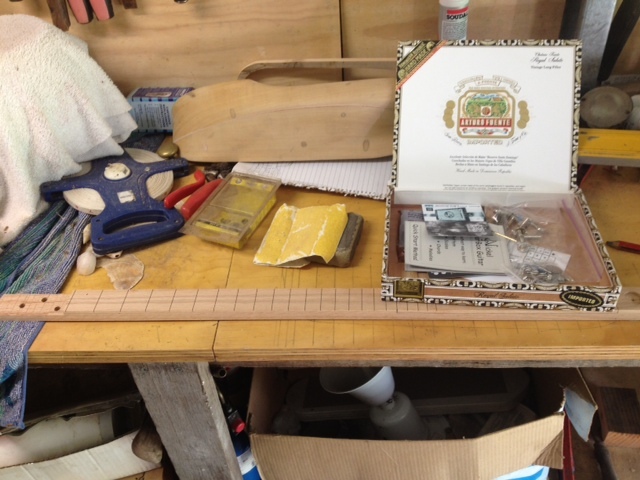 I am making a cigar box guitar. What’s a cigar box guitar? Well, it’s a guitar….. made out of a cigar box. Apparently there is evidence of instruments being made out of a cigar box was way back in 1840, with the first illustrated proof in 1876 of an etching of two civil war soldiers, with one playing a cigar box fiddle. The cigar box guitar, however become popular during the great depression in the 1930’s & played a large role in the beginning of the blues . With money being scarce & music being a popular pastime, there was a resurgence in homemade instruments & all that was needed to make a guitar was an old cigar box, a piece of broom handle and a couple of wires from the screen door. Now that’s old school! Not far along I know… but hopefully, within a few weeks I will have an awesome brand spankin’ new cigar box guitar & hopefully it will feature on a couple of tracks that I record for some TV shows.